For the month of April, we have been watching the skies, tracking the flight of the international space station. To know that there are people circling our planet puts everything in perspective. This is the only (golf) world we have – it must be protected. In researching this topic, it has been refreshing to see a proactive approach in this industry. There is a challenge to balance the sport’s environmental impact as it progresses forward responsibly. In an earlier post, I discussed a possible future for golf. However, with Earth day upon us, today was a good place to start making changes. My children’s school had just finished a neighbourhood clean-up on Friday, amongst other activities. We talked about doing a similar act of kindness this weekend. So, like a bolt of lightning did this idea hit me! Would it be a missed opportunity not to remind golfers of their impact on nature? We decided that anything on a grand scale could not be done, yet. Instead, after a quick trip to Golftown, Wal-Mart, and the Dollar store, we drove up to my favourite local course, Piper’s Heath. Our purpose was to have each golfer receive a free Pride Insignia tee, after a quick reminder of the day’s signficance. After explaining our intentions to the club attendant and groundskeeper, we handed them the framed photo (as above) and four bags of bio-degradeable tees. They both seemed shocked, but pleasantly surprised by such a novel idea. The course prides itself on its natural links style, and is fully aware of the maintainence difficulties. 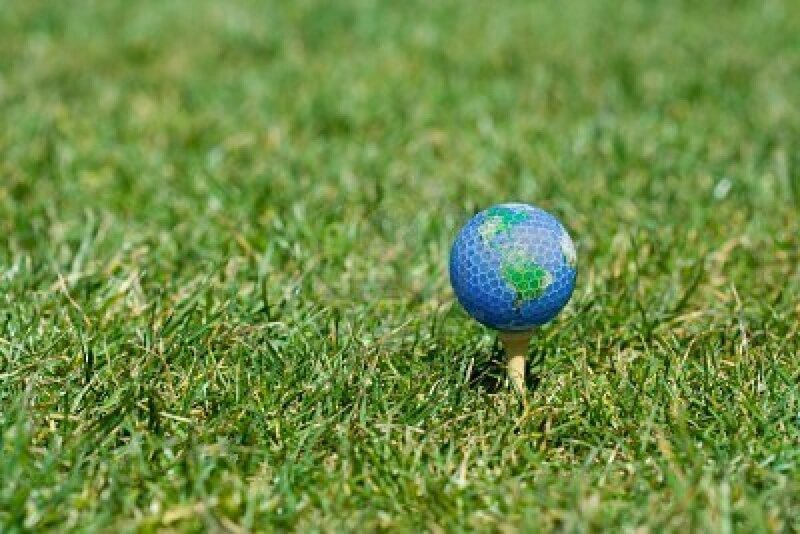 Any help in raising awareness between golf and the environment was most appreciated. Hopefully, this small step (for man) could turn into a giant step (for mankind)! Happy Earth Day, everyone! When a ball lands in the rough, does it make a sound? Yes! But not as loud as my pounding heart does at the thought of the annual ClubLink sale held every December at Glen Abbey golf club. After private members have filtered through the complete inventory of 2010 clothes, equipment, and clubs, the public gets their chance. You can find prices up to 75% off spring/summer levels. As was the case this year. I had been hesitant to jump into the recent Taylor Made R9 technology, as something new always appears the following spring (R11). But, lo and behold an R9 17 degree 4/5 wood…at $49.00. In the spirit of the holidays, I went seeking more “deals” elsewhere, namely GolfTown. After speaking at length with Paul and Big Larry, they helped set the club to my swing, with excellent results. I then searched more clubs in the R9 family, testing the 13 degree (strong) 3 wood, and 460 driver. Though, a cooler head, and wallet, prevailed, I decided that once I tested my 4/5 wood on the course this spring, I would be making the switch by the summer. The boxing week demo deals also provide the same rewards for those patient enough to wait from November, during clubhouse closing “sales”, up until Xmas – $50 for woods/hybrids; $125 for drivers. As I share a common happy birthday week with my dad (78 today! ), we always look forward to 2011, when the new year rings in the “best” equipment, leaving the “better” ones behind. ‘Tis the season for sales. So happy hunting to all, and to all a good night.